i cannot be classified as either a cookie or brownie prefer-ist. how could i possibly be silly enough to choose something like that? chocolate chip cookies, you better run far away, i have no interest in you at this time. i'm on a serious mission to have a brownie in front of me. 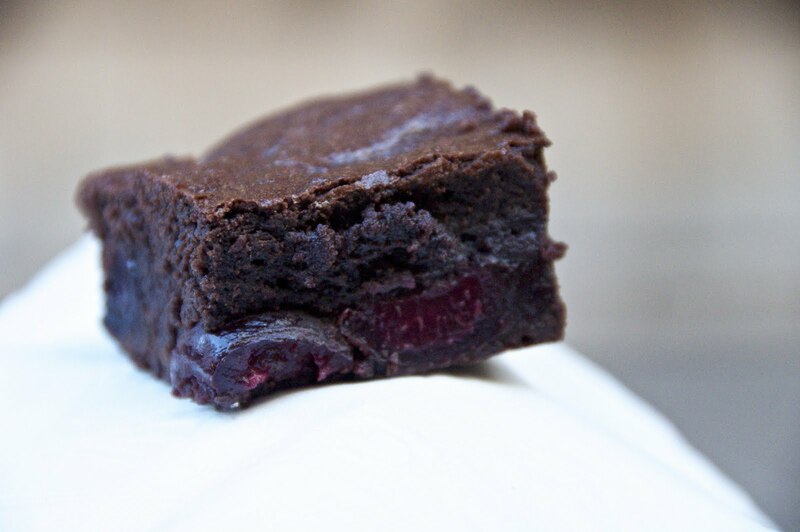 brownies are pretty normal, but they can be completely elegant, darling. can't you picture the countess eating a small square? oh darling, you must detect the complex flavors here, the cherries are just to die. are you paying attention to what i'm saying about these brownies, darlings? really do listen to me darlings, take notes even. elegance is learned. alright so phase one. 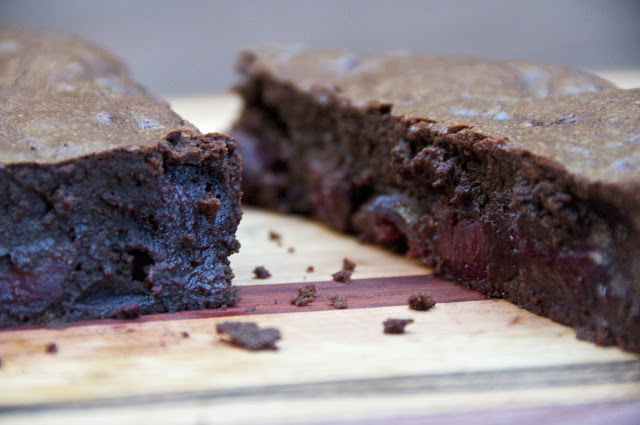 intense brownie craving. phase two. metaphase. or go to the kitchen and make those brownies. 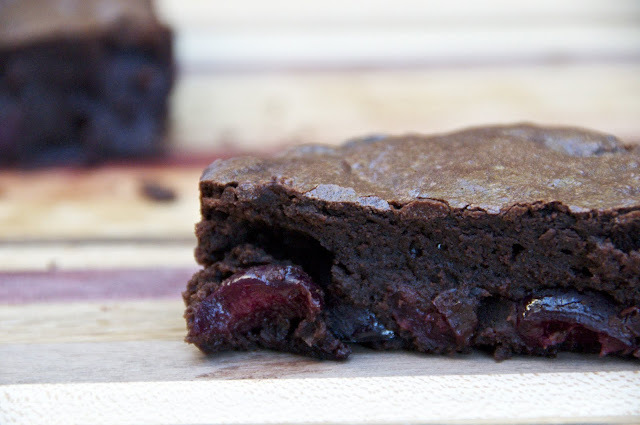 and put cherries in them because why the heck wouldn't you? phase three. 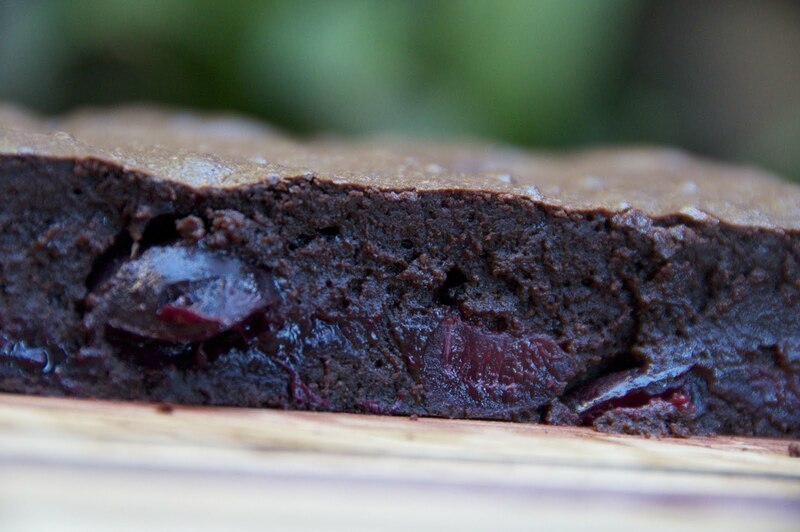 bask in brownie glory. then push them on people because if you don't, it is bad news for you and your stomach and your thighs. do you still see cherries at your market? quick go! 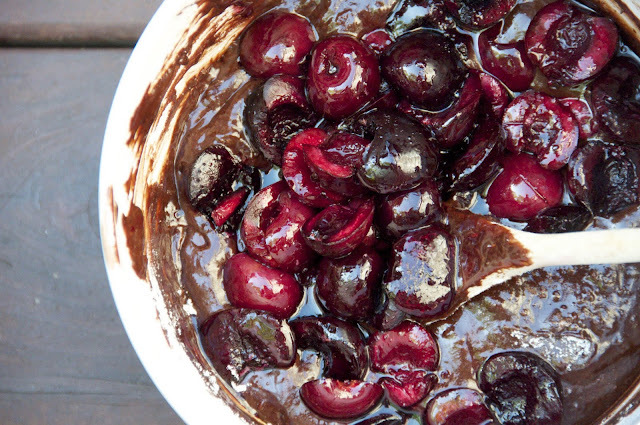 preheat the oven to 450. combine the cherries and 1 tbsp sugar in a small roasting pan and toss well. 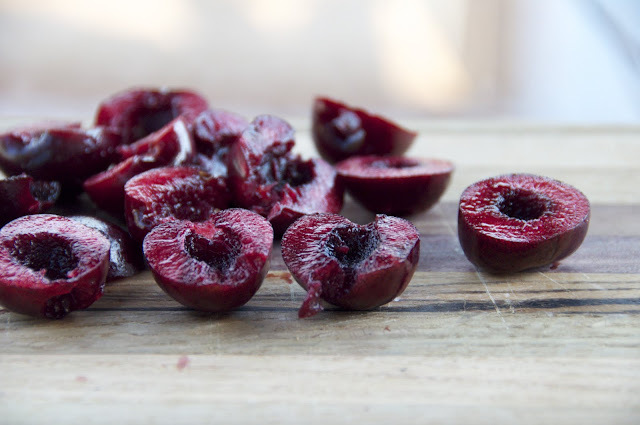 roast the cherries for about 10 minutes, until they release their juices. take the cherries out to cool and reduce the oven temperature to 350.
line a 9x9 inch baking pan with foil and grease. in a heatproof bowl set over simmering water, melt the chocolate with the butter, stirring until smooth. whisk in the cocoa powder until smooth. set aside to cool. in a medium bowl, combine the eggs, remaining sugar, vanilla, and salt, whisk until combined. then whisk in the warm chocolate mixture. stir in the flour with a wooden spoon until just combined. fold in the roasted cherries. pour the batter into the pan and bake until slightly puffed and a toothpick inserted in the center comes out with only a few sticky crumbs, about 35 minutes. transfer pan to a wire rack and let cool for at least 2 hours. as these sit they'll just get fudgier and more full of flavors, so by all means make them the night before. first of all...I'm totally enamored by the fact that you wrote about the countess AND metaphase in one post. You rock. second of all...these brownies are totally rockstar awesome. I'm in love. My thighs are in trouble. wow. these look so friggin good. making me crave chocolate pretty badly right now. ah! european butter has a slightly higher butterfat percentage. it's a little richer, creamier, and all around godly. 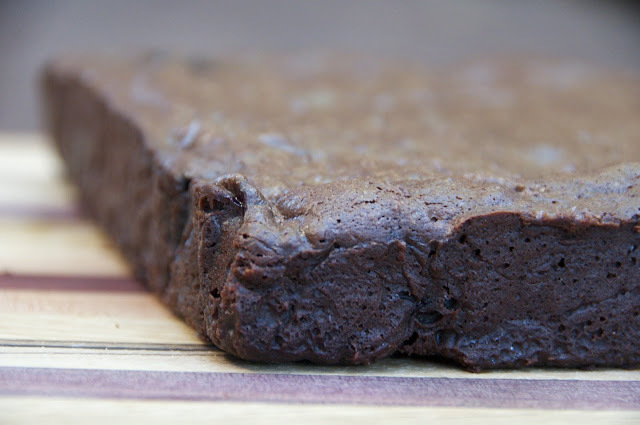 i like to use it in brownies and things when there are few ingredients so you can totally taste the difference in the end. and the greatest part is you can get it pretty much everywhere! have you ever made it with oil love?